much that I think we have read it at least four times a day since we took it out. To anyone out there with a toddler, this book is a winner. 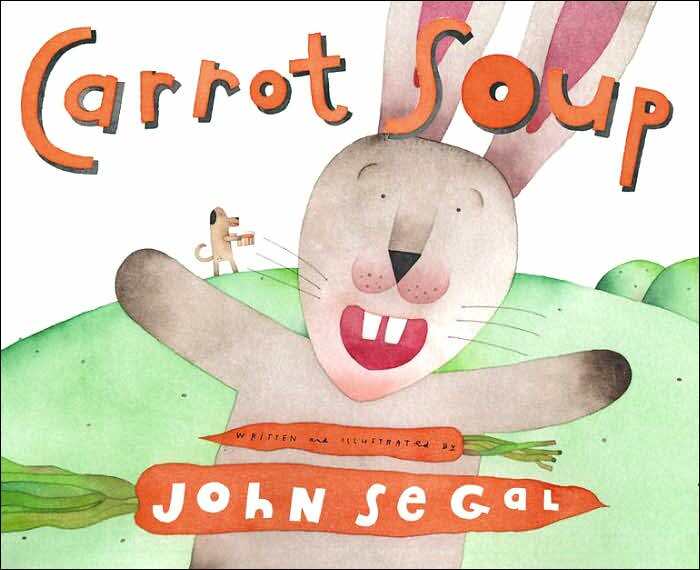 I bring this up here because on the very last page, Rabbit's recipe for Carrot Soup is listed. Now for those who frequent Margerum's Herbs, Etc. at Clark Park, you know that Noelle has the largest and most tastiest carrots in Philadelphia. Considering my easy access to these aforementioned carrots, of course we had to try Rabbit's recipe. The recipe is pretty basic and you can do whatever you want to it to suit your tastes, but in its most basic form I found it to be delicious. Sarah didn't though, which I think is more due to her personal tastes than anything wrong with the recipe. To test this hypothesis, I had my brother-in-law Stu and sister-in-law Emily give it a taste. Stu agreed with me that the soup was heavenly, but Emily wasn't so fond of it. Again, I chalked this up to her personal tastes (she is Sarah's sister...lol). Although it wasn't her bag, Emily gave me the most relevant criticism in that while it wasn't up her alley, it wasn't bad and it tasted like something she would have at a gourmet restaurant. Quite a rousing endorsement indeed. So here is the recipe. Give it a shot and let us know what you think. So far, its two and a half people for and one and a half against. And of course, if you need the carrots, see me on Saturday's at Margerum's Herbs at Clark Park. We shall see if there is any merit to Rabbit's recipe! 1. Saute' the onion and celery in butter in a large covered pot until tender. Add the shredded carrots and chicken broth. Bring to a boil. 2. Reduce heat and simmer with the pot covered for a half an hour. 4. Add salt and pepper to taste. Add dill or parsley (I used both). Serve. You didn't mention if your Son liked it. He wouldn't eat it. Ha. He's like that sometimes. 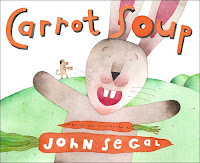 He kept saying "Carrot Soup! Carrot Soup! ", but wouldn't take a sip! Thank you for posting this recipe, Ben. My son, now 10, read that book six years ago and wrote the recipe in his journal. We made it together then and he loved it. I find myself with an abundance of carrots from our local CSA and thought again of that recipe. Alas, that journal is tucked away somewhere in the attic. It was so great to find it online. I know my son and his younger siblings will love it for lunch today. Best to you and Ethan.